Holding over his head a piece of paper with the words "+0/-5" written on it, Prime Minister Abe Shinzo runs out into a rainstorm saying, "I'll be fine with this!" A flash of light marked "Unconstitutional" zigzags down. In the distance, figures holding umbrellas cry out to the PM, imploring him, "Wait!" The House of Representatives on Tuesday passed a bill to rezone single-seat constituencies that would reduce the number of lower house seats by five to address vote-value disparities. The bill is expected to be enacted before the current Diet session ends June 26. The Yomiuri Shimbun is being fastidious with its "(t)he bill is expected to be enacted" phrasing. The LDP and the New Komeito hold a 2/3rds majority in the House of Representatives. The Diet is in session until June 26. If the House of Councillors does not take action on the bill over the next 60 days, the House of Representatives will override the upper house's inaction. There is, of course, an infinitesimally small chance of the ruling coalition allowing the passage of a rival bill through the House of Councillors, setting up a joint conference of both Houses to craft a compromise bill. For all intents and purposes, yesterday's bill is the law, unrepentant and unmodified. Opposition parties tried to get the LDP and the New Komeito to see reason. The opposition boycotted both the House of Representatives and the House of Councillors committee sessions examining the new electoral district map, the +0/-5 solution having been declared insufficient by more than one high court judge in March. The opposition parties hoped their show of unity would demonstrate to the ruling coalition parties that whatever may have transpired in the past, the +0/-5 solution was no longer viable. The boycott ended up being futile and what was worse mystifying, none of the leaders of the opposition managing to make clear what it was that they were trying to do. After boycotting the committee meetings, almost all the opposition parties returned for the full plenary vote. Only the Japan Restoration Association failed to show up for the defeat. The Democratic Party of Japan had a decent enough reason for showing up at the massacre. DPJ leaders wanted to demonstrate that the DPJ was not disinterested in the legislation but indeed actively opposed to it. Unfortunately this admirable attempt to clarify the party's stance on electoral district reform got drowned in a cacophony of catcalls. It is just too easy to point out that yesterday the DPJ voted against the bill fleshing out the +0/-5 plan despite having voted for the +0/-5 plan in December (Yes Secretary Kerry, they were for it before they were against it). By boycotting both the committee and the plenary votes the JRA walks away from the fight with a clean record. When and if the JRA wants to join hands with the LDP, it can excuse itself, saying, "Look, we may not have voted for your odious little electoral district reform bill...but we did not vote against it either." The new map is unconstitutional, de facto if not de jure. Using the results of the October 2010 national census, districts in the new map have been drafted so that the maximum disproportionality ratio is 1.998. This number is so ridiculously close to the unconstitutional ratio of 2.0 that one suspects the compilers were just trying to finish up and go home. Analyses by various news organizations have found that when one plugs 2013 population figures into the new map there are districts already above the 2.0 limit. Had the ruling coalition taken the March decisions of the high courts to heart, showing contrition for disproportionality in the 2012 election, and making concerted effort at real reform in 2013, the Supreme Court could tut-tut about the 2012 results but exonerate all with a "Go forth and sin no more" decision later this year. By staying stubborn and selfish, by insisting upon the +0/-5 framework despite its non-resolution of the disproportionality the Supreme Court finds objectionable, the ruling coalition is daring the Supremes to find the 2012 House of Representatives election unconstitutional and invalid. The justices of the Supreme Court would love to step away from this fight. They may find they cannot if they want to protect the Court's constitutional stature. Click on the image for a larger version in a new window. But I think the LDP's political calculation is on stronger ground than you suggest. Morally, they are definitely in the wrong, but by stepping barely within the legally-effective 2010 census they give the Supreme Court just enough space to spinelessly avoid confrontation with the administration. The LDP executives expect the courts will slither away from challenge, and I believe their expectation will prove justified. And, in the meantime, they get further mileage out of an unbalanced electoral system designed to overrepresent the LDP. Perhaps even time and seats enough to revise the Constitution. They play dirty, but unlike the DPJ they also play to win. 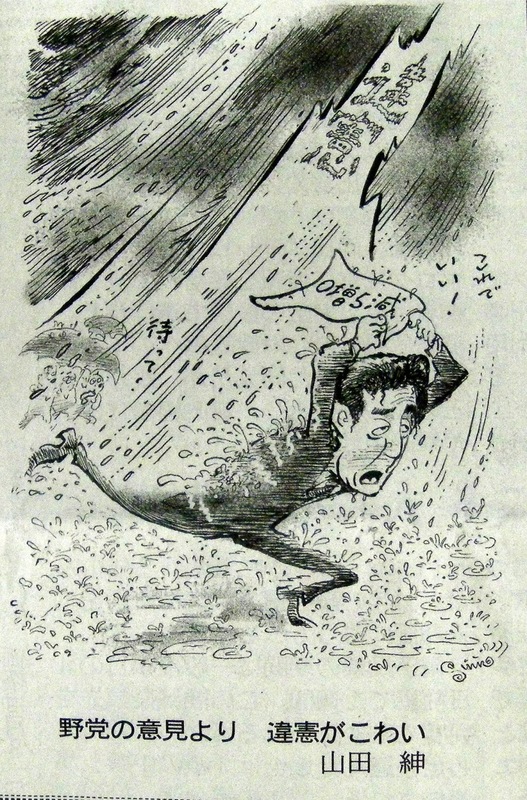 While I do not disagree with your assumptions (yes, the LDP does play to win) the cartoon and more importantly the publication in which it appeared demonstrates the risks Abe and his party are taking. When Yamada depicts the +0/+5 solution as a single sheet of paper a hurried Abe is holding above his head to fend off a downpour, the Sankei Shimbun's cartoonist has an expectation that the conservative readership will "get" the image -- that the readership will share his cynical view of both Abe's haste and the flimsy solution.